New Delhi: Growth in sales of passenger vehicles in India was the fastest among the eight largest auto markets in the world in the first 11 months of 2015 as vehicle purchases slowed in China and declined in Japan and the US. 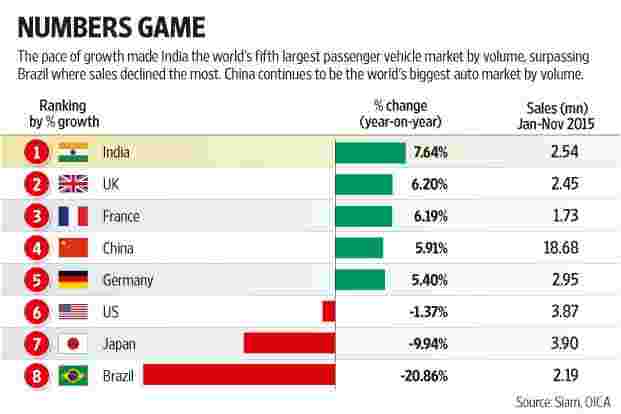 The pace of growth made India the world’s fifth largest passenger vehicle market by volume, surpassing Brazil where sales declined the most. China continues to be the world’s biggest auto market by volume. Growth in India was fuelled by positive customer sentiment in cities, gradual uptick in the economy and hope that the economy will do much better in the coming quarters. According to data provided by the Society of Indian Automobile Manufacturers (Siam) and Organisation Internationale des Constructeurs d’Automobiles (OICA), a Paris-based federation of international automobile manufacturers, India sold as many as 2.54 million passenger vehicles in the 11 months. In terms of percentage growth, the UK with 6.20% year-on-year growth was the second-fastest growing market, followed by France and China at 6.19% and 5.91%, respectively. China’s passenger vehicle market is at least eight times the size of the Indian market and 11 times that of the French one. Sales in other big markets such as Japan and the US declined 10% and 1.37%, respectively. India now trails Germany by 400,000 units and experts expect India to surpass the European country this year. “We are projecting India to become third-largest passenger vehicle market by 2018," Anil Sharma, principal analyst at consulting and forecasting firm IHS Automotive, said. “As we forecast double-digit growth for 2016, India is certain to cross the 3-million mark, which would mean surpassing Germany in the near term," Sharma added. It largely boils down to India’s very low vehicle ownership, which is 18 per thousand people as compared with 800 per thousand in the US. “There is ample scope to grow in high single or double-digits year-on-year," Sharma said. According to Abdul Majeed, partner and national auto practice leader at PricewaterhouseCoopers, it may be difficult to sustain the sales momentum if India does not get its economy back on track. Two consecutive bad monsoons and weak rural wage growth have prevented a meaningful recovery of the Indian economy. However, urban consumption demand has been helped by low and stable inflation, and a fall in borrowing costs. India’s economic growth accelerated to 7.4% in the second quarter of the current fiscal year from 7% in the previous quarter, riding on a spike in industrial activity and pick-up in investment demand. The government projects economic growth to be above 7.5% in the year to next March. In 2014-15, the economy grew 7.3%. According to Majeed, the growth in the global automotive market is very uneven. There are three key trends which, according to him, will have an impact on the global economy: Normalisation of monetary policy in the US; transition of Chinese economy from an export and investment-led growth model to a domestic consumption growth model; and falling commodity and oil prices. According to Vishnu Mathur, director general, Siam, passenger vehicle sales are on course to a strong recovery but more clarity on the regulatory front will be an added bonus. “Abrupt policy changes will impact sales and would prove to be deterrent for the industry when it comes to exploiting pent-up demand in the market," Mathur said. His reference was to the Supreme Court ban on the sale and registration of high-end diesel passenger vehicles, with engine capacity of 2000cc and above, in Delhi and the National Capital Region till 31 March.